The fate of Joe Arpaio, who embraced the moniker “America’s Toughest Sheriff,” rests with a judge after lawyers wrapped up closing arguments Thursday at his criminal trial on the topic that helped Arpaio win a nationwide reputation —immigration. Joe Arpaio, who held six terms as sheriff of Arizona’s Maricopa County before losing reelection last November, is accused of criminal contempt for defying a judge’s 2011 court order to refrain from racially profiling Latinos during patrols. 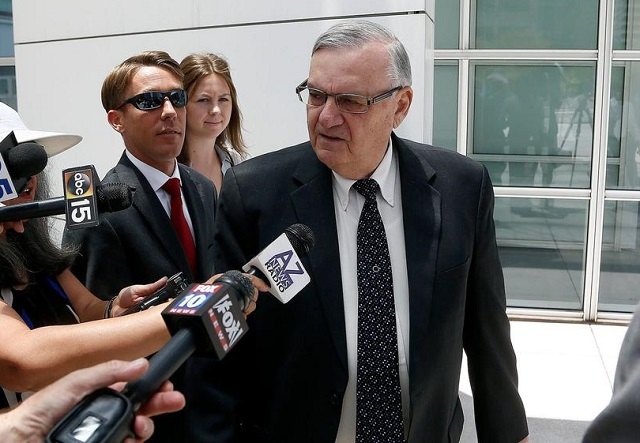 The question at the center of the trial, which started in late June in a federal court in Phoenix, is whether Arpaio intentionally violated the court’s order to stop Sheriff’s Department personnel from racially profiling during patrols. In order to win a conviction, prosecutors must prove Joe Arpaio intentionally violated the judge’s order. Despite acknowledging that he prolonged patrols which targeted Latinos after the judge’s 2011 order, Arpaio insists any profiling was not intentional. The case was not heard by a jury. If U.S. District Judge Susan Bolton finds Arpaio guilty of the misdemeanor charge, the 85-year-old could face up to six months in jail. The brash and outspoken Arpaio won national fame — or infamy, depending on the point of view — for policies that made incarceration tough (such as housing inmates in canvas tents) or possibly humiliating (such as forcing inmates to wear pink underwear). Most of all, he was known for crackdowns on illegal immigration. With 4 million people, Maricopa County is Arizona’s largest county and home to Phoenix. According to Pew Research Center data from 2014, 30% of country residents are Latino, almost double the number from 1990. Joe Arpaio’s latest legal battle has drawn the attention of many immigrant activists who say a conviction would mean a long-delayed comeuppance. But Joe Arpaio’s tough immigration tactics have also drawn support, including that of President Trump, who invited Joe Arpaio to stand alongside him at rallies during his presidential campaign. Until last fall, he coasted to reelection every four years. A defiant Joe Arpaio once boasted that that he continued to crack down on immigrants illegally in the country even after complaints alleging profiling by his department. “After [the Justice Department] went after me, we arrested 500 more just for spite,” Arpaio told supporters in Houston in 2009 during a fundraiser for an anti-illegal-immigration group. Joe Arpaio’s latest legal fight is one of a series he has faced over the years. In years past, was able to project a defiant tone after prevailing in court. For example, in 2009, his attorneys argued successfully that then-U.S. District Judge Mary H. Murguia could not hear his case impartially because her twin sister was the leader of the National Council of La Raza, a prominent advocacy group. But in recent years, he’s suffered courtroom setbacks. In 2013, a judge found that Joe Arpaio’s deputies had systematically profiled Latinos during traffic stops as they tried to find people in the country illegally. In January 2015, U.S. District Judge David Campbell found that Joe Arpaio improperly used a law intended to combat identity theft. Instead, his department employed the law to round up more than 800 men and women in the country illegally during workplace raids. The judge called the use of the law unconstitutional.